Since horseracing first began, people have wagered on the outcome of the race. There are numerous factors that will influence the result of a race, such as the quality and fitness of the horse, the skill of the jockey, the track conditions and distance of the race. For most, the thrill of going to the races involves the thrill of winning a bet, whether through calculated skill or just sheer luck. In NSW, betting (wagering) is conducted by bookmakers and Tabcorp (license held by TAB Limited). Bookmakers are persons licensed by Racing NSW to offer betting services at NSW race meetings and via the telephone, and Tabcorp is licensed by the NSW Government to conduct totalisator betting at racecourses and off-course through its various retail outlets (cash agencies, telephone and internet betting). Fixed Odds betting is offered predominately by on-course bookmakers. With fixed odds betting the operator offers odds against the chances of each runner winning or running a place in a race. Customers then place a bet on that runner at the odds offered at that time, and the stake of the bet is multiplied by the odds on offer. If successful, the punter receives the resultant amount plus his original stake. A totalisator is a system used to enable persons to invest money on events or contingencies with a view to successfully predicting specified outcomes of those events or contingencies and to enable the money left after the deduction of commission to be divided and distributed as dividends among those persons who successfully predict those outcomes. Racing NSW encourages responsible gambling. Make a decision before you start the day on how much money you are willing to spend on wagering. If you are only beginning your hand at wagering, start small (with bets between $1-$10) and get the hang of things. Make sure you bet the amount you feel you can afford comfortably and don’t spoil your day. Favourite:The easiest place to start is the favourite of the race. The favourite is judged as most likely to win the race, and on which the most money has already been bet. The odds on the favourite will be shorter, meaning you will receive less money if it wins. Form: Your race book or form guide will tell you all the details of the horses and jockeys with a brief commentary on the horses form. The horses’ most recent results or ‘form’ are listed in order of occurrence and are provided to give punters the basic information on which to evaluate past performance. You can also find the form prior to a race meeting on the Racing NSW website and other dedicated form websites. *please note the form does not always run as the form predicts, it is to be used as a guide only. Jockey: There are plenty of talented jockeys in NSW who ride at the various race tracks. Some punters like to pick a jockey and stick with them for the day. Trainer: Like jockeys, there are many talented trainers who are more often than not competing for a training premiership. Following the form guide and racing news will help you find out which trainer is ‘in form’. The Odds:The favourite with shorter odds if successful will give you a modest return, while the higher the odds (and a lower assessed chance of winning) can give you a much greater return. People like to cheer for the underdog and sometimes it does pay off. Track Condition: The condition of the track can influence a horse’s performance. Some horses prefer dry tracks, while others wet. Horses that enjoy running in heavy wet tracks are sometimes called ‘swimmers’ or ‘mudlarks’. Colours, Names & Numbers: With so many factors influencing the outcome of a race, some people like to play their luck and pick a winner based of the pattern of the jockey’s colours. Some may chose an interesting name, while others may pick a sentimental number for example Race 7 number 7. State the name of the racetrack. State what number race you’re betting. State the dollar unit of your bet. State the type of wager. You can bet on a single horse to win or place, or on a combination of horses. State the number of the horse or horses you’re betting with. State the number of the horse or horses you're betting with. Betting is suspended when the horses jump from the barrier, so be sure to place you bet prior to this time, which will be printed in the racebook and displayed on course. Find a good place to watch the race and look out for the jockeys colours and saddlecloth number. You can listen to the commentator call the race out loud, and watch on the big screen if necessary. If you’ve brought your binoculars along now is the time to use them. Congratulations. If you your horse has won the race, you will need to wait for the stewards to announce ‘Correct Weight’ (after the jockeys have returned to scale and no protests are lodged) before bookmakers and the tote will pay out. Win: The most popular bet you can have. Simply pick the runner that you think will finish 1st in a race. Place: Pick a runner in a race and if your runner finishes 1st, 2nd or 3rd you will collect your place dividend. (Under normal circumstances a 3rd place dividend is only paid in races with eight or more runners). An Each Way bet (Win/Place) combines the Win and Place bets. If your runner wins, you will collect both a Win and Place dividend or if your runner finishes 2nd or 3rd you will collect the Place dividend only. Quinella: To win the Quinella you are required to correctly select the two runners that finish 1st and 2nd in a race, in any order. Exacta: An Exacta requires you to correctly select the two runners that finish 1st and 2nd in a race in the correct order. Duet: The Duet requires you to correctly select 2 of the 3 placegetters in any order and is only available on races that have eight or more runners. The Duet will pay three dividends for the following combinations: 1st and 2nd, 1st and 3rd, and 2nd and 3rd. Trifecta: The Trifecta requires you to select the runners that will finish 1st, 2nd and 3rd in a race, in the correct finishing order. Flexi betting is also available. First 4: The First 4 requires you to select the 1st, 2nd, 3rd and 4th placegetters in the correct finishing order. Available in Flexi betting. Quadrella: A Quaddie requires you to pick four winners from four races nominated by TAB at the one meeting. Available in Flexi betting. The Quaddie for each race meeting is marked in the "Exotic Bet Info" column on Today's and Tomorrow's Racing Schedules on tab.com.au. Quaddie legs are marked as QAD. Big 6: A BIG 6 requires you to pick six winners from six races nominated by TAB. The races that make up a BIG6 may be at the same race meeting or at different race meetings. There is at least one BIG6 available every week. Available in Flexi betting. Available BIG6s are indicated in the "Exotic Bet Info" column on Today's and Tomorrow's Racing Schedules on tab.com.au. All Up: A more complex bet which involves parlaying your winnings from one race into one or more other races. To parlay means to create a single bet that links together two or more individual bets and is dependent on all of those bets winning together. Betting Exchanges: offer a form of betting where the operator accepts bets from punters on the predicted outcome of a certain contingency (e.g a horse winning a race) and matches them with bets placed by other punters who select the opposite outcome. In effect the bet is between two individual punters and the operator does not become party to the bet. The operator then extracts a commission from the winnings of the successful punter. What is boxing? : Available on Quinella, Exacta, Duet and First 4. When you ‘box’ the runners in your bet, you cover all possible combinations for the finishing order. What is a multiple bet? : Available on Quinella, Exacta, Duet, Doubles, Trifecta, First 4, Quaddie and BIG6. A multiple bet is where you pick more than one runner in each leg of the bet. What is Flexi betting? : Available on Trifecta, First 4, Quaddie and BIG6. Flexi betting allows you to nominate the total amount you would like to spend on your bet, so you can include as many selections as you like at an outlay that suits your budget. If your bet is successful, you will collect a percentage of the full dividend. Scratchings and Late Scratchings: A scratching is when a runner is withdrawn from a race. If a runner is withdrawn after 9am on the morning of the race, this is known as a ‘late scratching’. Bets that Contain a Scratching: There are different ways a scratched runner will affect a bet. WIN/PLACE/EACH WAY BETS: if a runner is scratched, all bets placed on that runner will be refunded. QUINELLA/EXACTA/DUET/TRIFECTA/FIRST 4: If a runner is scratched, all combination containing that runner will be refunded. Any combination that do not contain that runner will still be ‘live’. RUNNING DOUBLE/DAILY DOUBLE/QUADDIE: Any scratched runner/s will be replaced with a ‘substitute’. The substitute runner will be the favourite in win betting and will be announced by the race caller and/or advised via the TV screens throughout the racecourse. Any bets containing a scratched runner can be cancelled up to the start of the first leg. Check Your Ticket: Make sure you check your betting tickets immediately after they have been handled to you by the operator to ensure your bet is correct. Cancelling Bets: Bets which do not accurately reflect the bet you wished to place can be cancelled up to two minutes after it has bee placed. Tell the operator you would like to cancel the bet and hand them your ticket. Payment of totalisator tickets: Tickets sold by the On-Course totalisator may be collected either on-course, or at any off-course TAB outlet, for a period of 12 months. It is also possible to collect tickets sold off-course on the on-course tote. Lost and Destroyed Tickets: A claim will only be considered if it is lodged in writing with the head office of TAB within 21 days of the date of the race meeting accompanied by a fee of $11 including GST. Claims should be forwarded to the TAB head office, TAB LTD, GPO Box 4168, Sydney NSW 2001. 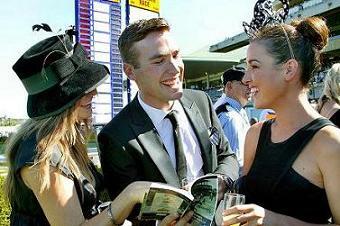 Racing NSW encourages participants to gamble responsibly.